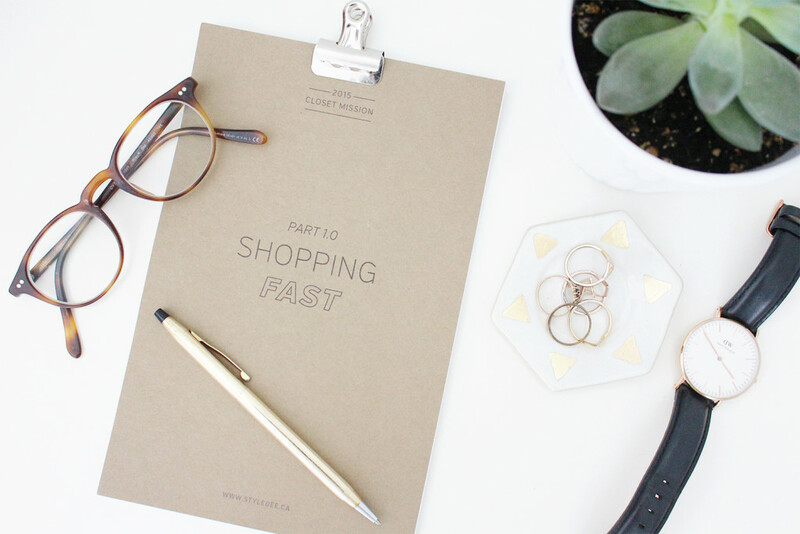 Ready to dig into this shopping fast with me? Here goes! Why start with a fast? Many of the ‘Lean Closet’ tutorials I’ve read dive right in with a big closet purge. While that’s an integral part of the process I wanted to start my mission with more of a mental closet purge to clear my mind of all the ‘must-haves’ and ‘wish list’ items floating around in my brain. Not to mention letting the holiday spending dust settle and my VISA balance calm down significantly. I also think it’s critical to begin any life change with a pause and some introspection. We’ve been cultivating our shopping habits for a lifetime and they won’t change overnight or with the simple eradication of old jeans and ill-fitting sweaters. This closet mission is as much about getting to know yourself as it is about building your dream closet. I believe the better you know yourself the better choices you’ll make when the time comes. What are the rules? There are no official rules and I’m just learning as I go here too. This particular ‘fast’ is focused on 30 days free of clothes shopping (and/or beauty products if you want cut back in that department too). 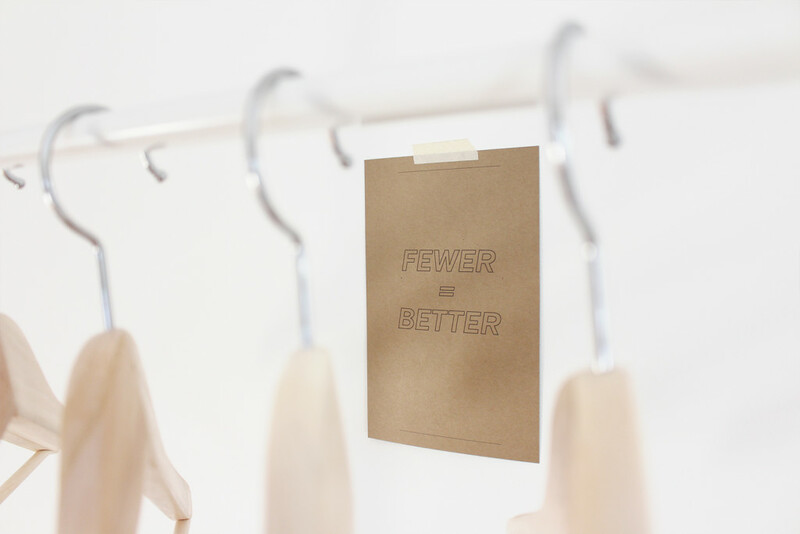 It’s just about the non-essentials so if all your tights have runs, pick up a new pair, you won’t be disqualified. Really it’s about taking time to simplify and gain a little bit of perspective. Here’s where I’m at. Technically my 30 days are up since I stopped shopping for myself at the end of November but I wanted to hit a true reset button and carry on through January. I can say I survived the first fast but with all the Christmas shopping (though not for myself) I’ve got to be sure I wasn’t getting a vicarious fix. So as far as this mission is concerned I’m on day 8 of my shopping fast. Working on this project has been a great distraction so far but we’ll see how that changes as I settle back into my routine at work. 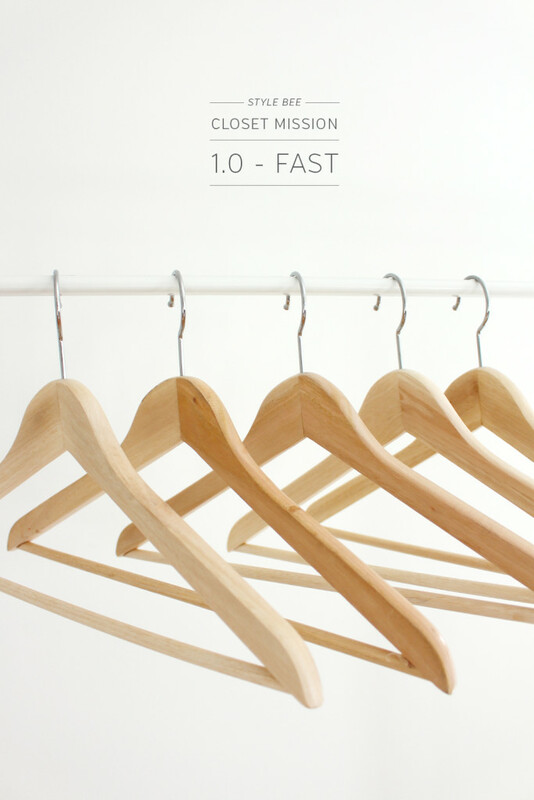 Go 30 days without buying any clothes (and/or makeup). Take a brief stock of closet pros and cons. What items do you always reach for? Which ones haven’t seen daylight in months? Years? This might sounds kinda lame or hokey but it matters. On a good day you might not even think about shopping once. On a bad day you might feel frustrated, anxious and annoyed about this whole mission or you might even cave and that’s OK. It’s all part of the process but it’s not in vain if we can learn from these moments. It’s time to let the things that matter come to the surface. Often shopping is a distraction or a method of procrastination that blocks us from thinking about or doing things we’ve been putting off. No shopping for a month, no big deal! Erm, not so much actually, so here are 10 tips that I’ll be testing out to help me remain successfully shopping free for 30 days. Small Steps. Start easy with just a three days of no shopping and see how it goes. Repeat. If you go three days without shopping, awesome! Let’s try that again. One resolution at a time. This is the only New Year’s resolution I’m working on right now. The work out regime and healthier eating habits will have to wait. Write your goal down. Put it somewhere you will see it often like your planner or desktop. Heck plaster it on your bathroom mirror if that helps! Record your experience. Keeping a little journal makes a big difference and will prove an invaluable resource when it comes time to make any wardrobe decisions. I made one you can download below! Fast Friends. Moral support is key to making any lifestyle changes and it could be really fun to do your shopping fast with a friend or coworker. Plus you’ve got me! Feel free to reach out at any time and I’ll be happy to hear what you’re thinking. Eliminate temptations. Unsubscribe and unfollow brands and touch points that leave you feeling insufficient or wanting. Don’t take a leisurely stroll down the street your favourite boutique is on. You get my drift. Pick an alternate activity. At first I found this ‘tip’ a bit patronizing but then I realized that it’s exactly what I’m achieving by doing this closet mission. You’ve got some free time for the next 30 days so why not take a course or work on a project you’ve been meaning to start? Visualize. Just picture that savings account balance growing or the weekend trip you’ll be able to go on. Reward Yourself. This one is a slippery slope so watch out. Consider rewarding yourself with something other than shopping, like a great dinner with your fella or a spa day with a girl friend. But be weary of the material reward, it might just lead to a relapse. If you’re confident you can keep it under control then go for it! I’ve put together a little workbook that I’ll be using to take notes and stay on track (sorry it’s a bit late!). It’s also something I think will provide some insight when I’m ready to start defining my style. It includes all the objectives and tips noted above along with a 30 day journal and a few other little exercises to get you thinking about your closet and lifestyle. You can print it out or download the editable version. Next week I’ll be sharing some of my daily reflections and a quick mid-way analysis. Simply print, crop pages down the centre (there are 2 per sheet) and clip together. Simply download the pdf and use Adobe to edit fields and save your notes digitally. So what do think? Are you up for it? Have any questions, concerns or other ideas? Please feel free to share! 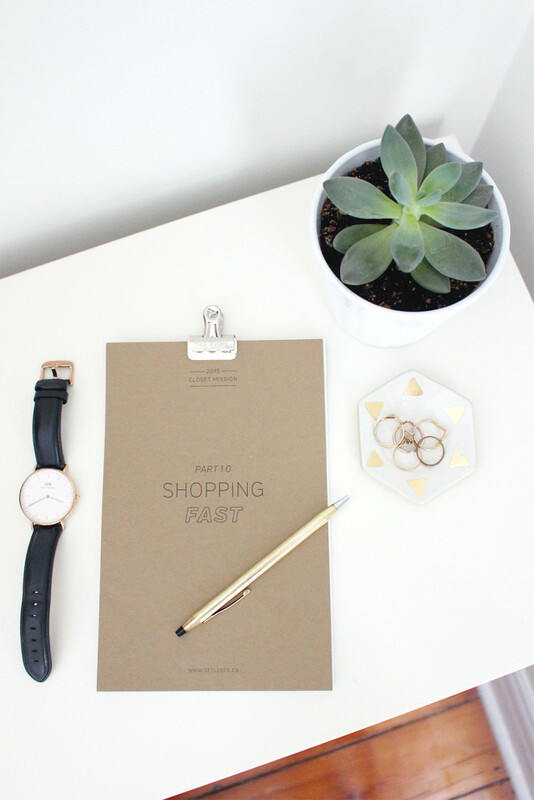 Been following your blog for awhile now and I’m using your fast to jump start my own! Thanks for making cute little workbooks too. I know im a bit late, but im in !! !